A beautiful 2/5ct I-I1 colour and clarity diamond solitaire, styled in 18ct white gold with glittering diamond set shoulders. The Leo Diamond is a product of four generations of expertise in the art of diamond cutting, resulting in the first diamond that was independently certified to be visibly brighter than other diamonds with 8 additional facets compared to traditional round brilliant cut diamonds. Leo Diamond rings are independently certified by the IGI/GSI for colour, clarity, carat and cut. 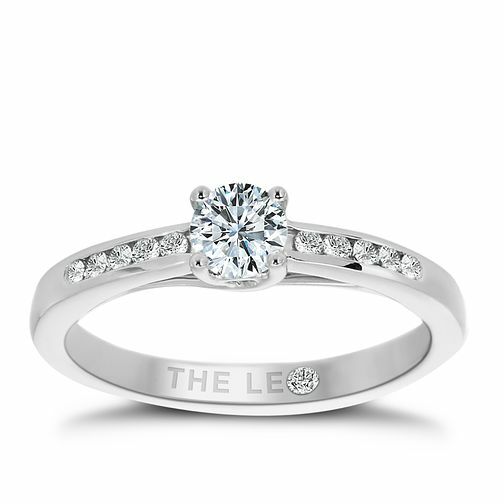 Leo Diamond 18ct white gold 2/5ct I-I1 solitaire ring is rated 5.0 out of 5 by 1. Rated 5 out of 5 by Anonymous from Beautiful engagement ring My fiance proposed without a ring and we picked this one together. It is everything I ever wanted from an engagement ring...it has a classic solitaire look with diamond shoulders. The whole ring sparkles ridiculously in the light and I have nearly crashed my car on more than one occasion because it catches my eye and I have to look and admire it! !